Could a hashtag challenge the Aliyev regime? Azerbaijan's political migrants are behind a new public campaign to draw attention to authoritarian rule at home. Judging by the reaction, it has the regime rattled. Source: RFE/RL Azerbaijani Service. Used with permission. “Come home and we’ll teach you how to engage in political struggle. 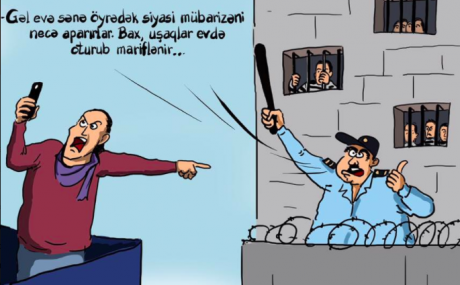 Take a look, the kids are staying home and learning,” says the the Azerbaijani police officer in the cartoon above to the man pointing his finger at him as he live-streams. This cartoon, published by RFE/RL’s Azerbaijani Service, appeared after a group of Azerbaijanis living in Europe started a new political campaign. It illustrates the all-too familiar reality of the consequences Azerbaijani political activists face and how the Aliyev regime reacts to their activism. Called “Know Your Dictator”, the campaign has so far made it to several European capitals, United States, Canada, Russia, Georgia and even Azerbaijan. The idea is simple: an A4 picture of Ilham Aliyev (and sometimes both father, Heydar Aliyev and the son) with the phrase “know your dictator” plastered across it. The group upped their game during Novruz celebrations, printing larger posters to congratulate the “Family of Dictators”. Ordukhan Temirkhan and the "Know your dictator" campaign, Berlin. Source: Youtube. The last time the Azerbaijani diaspora was involved in this kind of action was January 2017. An Azerbaijani MP described Azerbaijani labour migrants living in Russia as the “scum of society”. In response, Azerbaijani migrants flooded Facebook with their video responses, not just from Russia, but from Ukraine and even Germany. But this action was a one-off, and this was probably related to the way the Azerbaijani diaspora is structured. Often viewed as a political tool and a form of political lobbying in the hands of the government, Azerbaijan’s diaspora is relatively passive. As Sergey Rumyanstev writes: “The goals of the regime in power ‘at home’ dictate those of Azerbaijan’s diaspora organisations,” which is what they do by telling “the truth” to the world about Azerbaijan – the country’s accomplishments and the reforms implemented by the Aliyev family. As a result, these diaspora groups only “entrench the cult and legitimacy” of the regime at home. What makes “know your dictator” campaign unique, however, is the Aliyev government’s response. It is far from pleased, and the regime is responding by threatening to shut down social media platforms ahead of snap presidential elections on 11 April. Of course, it’s too early to tell whether a hashtag can defeat the government, but so far, it seems, the hashtag is winning. 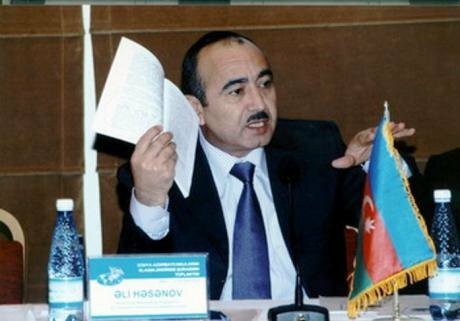 In mid-March, Ali Hasanov, Azerbaijani presidential aid on civic and social issues, wrote on Facebook to respond to people in the diaspora critical of the regime, calling them “tools in the hands of anti-Azerbaijani powers”, and promptly accusing them of “losing their sense of patriotism” (which is, it seems, a “terrible national tragedy”). Ali Hasanov. Wikipedia / VOA. Public Domain. A week later, Hasanov posted a new note, this time minimising the numbers of those involved in anti-Aliyev rhetoric abroad to a handful. “They are five to ten people who have sought political asylum by forged means, and now engage in anti-Azerbaijani activities,” wrote Hasanov. By contrast, there are 15,000-20,000 Azerbaijani immigrants (out of a total 100,000 Azerbaijanis living abroad) who always protect “the interests of our country” in Europe, the presidential aid added. Hasanov’s response begs the question: why would a top government official waste his time writing about five people on his Facebook page (and not once, but twice)? As it turns out, Hasanov is not alone in responding. 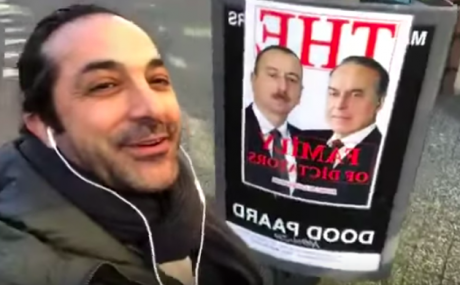 In a televised debate of presidential candidates (in which Ilham Aliyev did not participate), one candidate tried sending a different message to Azerbaijani dissidents. “We have received information that the ASALA [Armenian Secret Army for the Liberation of Armenia] is planning to kill them [exiled activists] in order to make the government look bad,” exclaimed Hafiz Hajiyev, without providing any further evidence or explaining where this information came from. In the meantime, Mirshahin Aghayev, the host of a new television channel, took it to another level, using profane language to address the men behind the “Know your dictator” campaign on air. Aghayev is the co-founder of the former Azerbaijan News Agency (ANS), which lost its license in 2016 in the aftermath of the failed military coup in Turkey – ANS had prepared an interview with exiled cleric Fethullah Gülen. Desperate, Aghayev even appealed to Azerbaijan’s dead president Heydar Aliyev to help him in a difficult situation. Though he was a laughing stock at the time, Aghayev seem to have his prayers answered. And not only his prayers: Real TV is reportedly indirectly owned by Azerbaijan’s ruling family. Tural Sadigli believes that the Azerbaijani government is afraid they are losing the upper hand in the game between them and Azerbaijan’s political immigrants. This is why they’re resorting to all kinds of new means of retaliation, including setting up new television channels where the anchor can swear and humiliate others without retribution. “We are certain, it is the government who has directly ordered people to come after us,” says Ordukhan Teymurkhan. It is obvious this is happening when even Ali Hasanov himself has been deployed, says Teymurkhan. “I just wish they came after us directly and left our families alone,” he adds. A classic of Azerbaijan’s patriotic narrative, labeling critics at home and abroad as Armenian spies is useful if you want to play on national sentiments. It remains a handy last resort in the hands of the ruling regime when influencing opinions. Writing of Sadigli, Teymurkhan and others as having lost “their sense of patriotism”, Ali Hasanov knows too well the impact these words can have on a society that has experienced war, is living in a state of an on-going war, and faces the possibility of the conflict resuming at any time. Rallying support behind misinformation and accusations is an effective measure in a tightly controlled society, lacking any form of freedoms. 15 March: anti-government rally in Washington DC. Source: RFE/RL Azerbaijani Service. On 15 March, a group of Azerbaijanis staged an anti-government rally in Washington DC. Unlike the protesters in Europe, the participants of this rally all wore Anonymous masks. There is no information of who organised the rally. None of the DC based human rights organisations were contacted. The anonymity led to a wave of speculations in Azerbaijan. Some have said these were the children of government employees studying abroad, while activists chose to embrace the action, explaining the masks as a measure of precaution: these people don’t want their family members to come under pressure back home. Whether it’s anonymous protest in Washington or the “Know your dictator” campaign in Berlin, it’s clear that official Baku is antsy. We are seeing a shift from the usual measures of trying to scare activists abroad by punishing family members at home, to having high-ranking government officials and the propaganda mouthpieces make statements that clearly show discomfort at the campaigns abroad. The discussion about shutting down social media platforms ahead of the presidential elections only attests to pre-election insecurity in government circles. Hadi Rajabli, chairman of labour and social policy committee, in a statement issued on 28 March, said he wasn’t calling for Facebook to be shut down, but that Azerbaijan had to rely on the “international experience of blocking sites and pages of users damaging ‘moral and cultural values of people’”. In a country where old habits die hard, it is still too early to tell whether a dissident movement of immigrants can force the ruling regime to change.